One of the best features of Excel is that it can easily become a calendar that will let you track days, create count downs, and much more. Learn to calculate days left in Excel along with other date tracking tricks with easy formulas. Download our example spreadsheet to follow along and learn this tool. Once you have opened the Excel document, you will see three spaces. 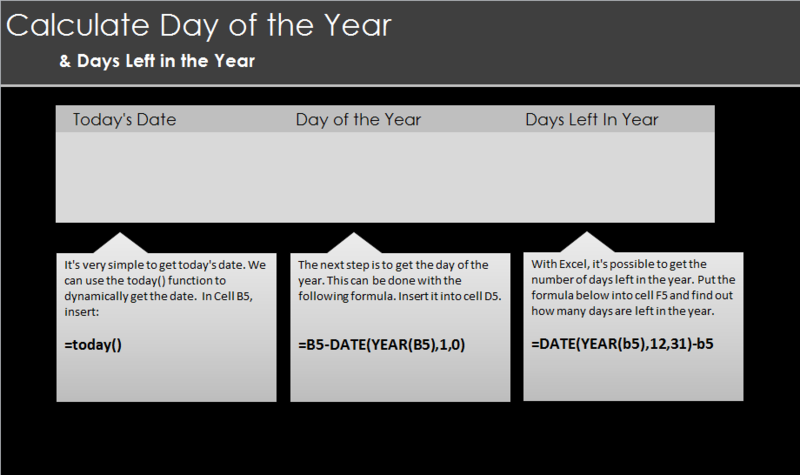 One to learn how enter the date, another to do the date and year, and finally an area to calculate days in a year. The date will appear. That’s it! This will show you the day of the year. Finally, you can create the feature that is especially great: an automatic calculator that will tell you how many days are left in the year to complete your New Years resolution you already forgot about. The days remaining in the year will appear and you have successful created a calendar that will chart days left in the year. If you want to create your own, simply change the “b5” and other cell numbers to whatever cells you are using in your own format.